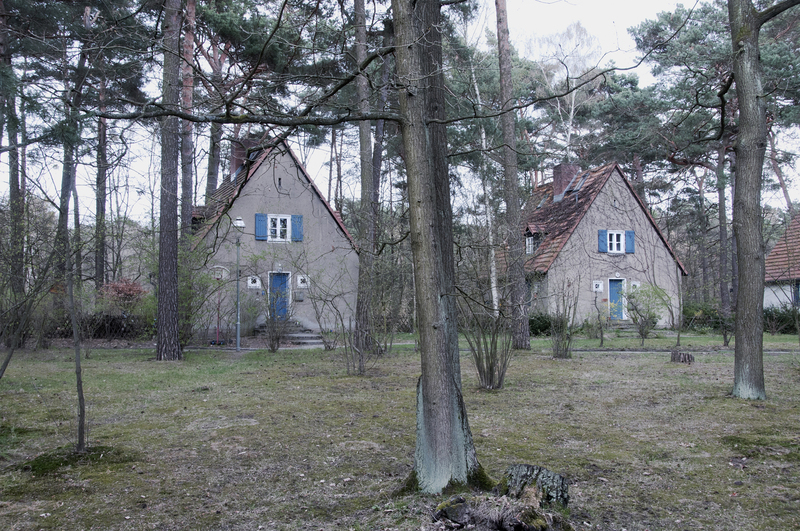 These houses were built by Hitler’s National Socialist regime for SS officers and their families. 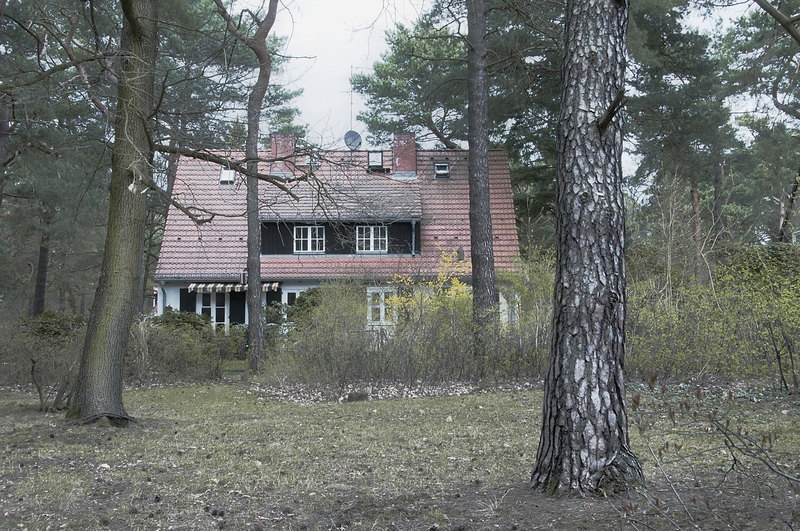 They are located in an idyllic forest along the shores of Krumme Lanke, on the west side of Berlin in Zehlendorf. This setting makes me think of the German fairy tale Hansel and Gretel, recorded by the Brothers Grimm and published in 1812. In the story, the two children are threatened by an evil witch who lives in a charming house deep in the dark woods. 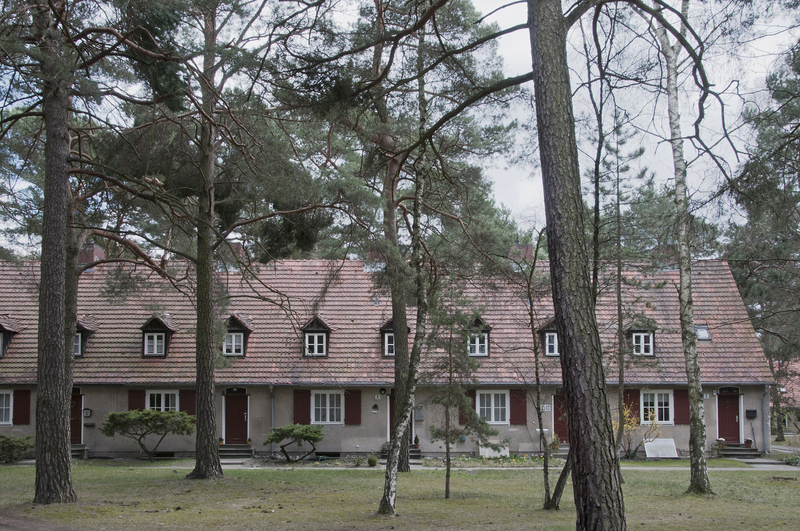 The photograph above shows a typical example of Nazi residential architecture. The tiny houses with steep tile roofs and shuttered windows are scattered about in a natural setting. These detached, semi-detached and terraced houses were allocated to SS officers according to rank. In his book titled Architecture in Berlin 1933 – 1945, A Guide Through Nazi Berlin, Matthias Donath writes: Most of the residential buildings and settlements … were given a more traditional form. The buildings had steep tile roofs; the windows could be closed with shutters. The appearance of half-timbered construction gave the houses a local flare. A typical example of this is the Zehlendorf SS settlement built in 1938 – 1940 in Berlin that now bears the name Waldsiedlung Krumme Lanke. The photograph above shows a typical example of what Matthias Donath refers to as a traditional residential settlement, consisting of houses with steep tile roofs and shuttered windows. These detached, semi-detached and terraced houses were allocated to SS officers according to rank. To see examples of what Donath refers to as the mammoth neo-classical architecture that Albert Speer hoped to construct for Hitler’s new world capital Germania, please see my previous posts of the 1936 Berlin Olympic Stadium and Tempelhof Airport. At the same time that Karlshorst was being built, the Nazis were constructing housing for their SS troops on the other side of Berlin. Zehlendorf is located approximately 30 kilometres west of Karlshorst on the shores of Krumme Lanke. In his book Berlin 1933-1945, Maik Kopleck describes the Zehlendorf settlement: SS “Comradeship” Housing Development, architect Hans Gerlach. 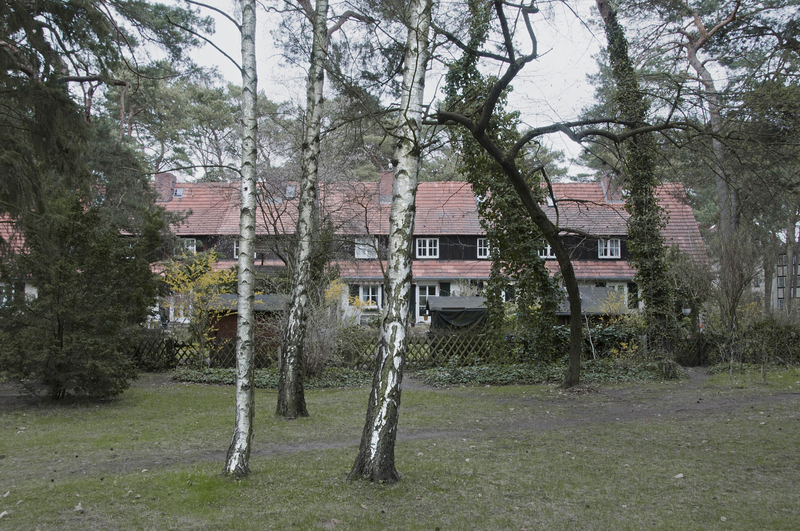 In 1937, the SS started to build 600 houses in the idyllic countryside of nearby Grunewald for members of the “racial elite.” Architect Hans Gerlach agreed his plans with the SS “Central Office for Race and Resettlement.” The houses were to be “simple and true, while display decency and dignity.” The detached and semi-detached and terraced houses, still standing today, were allocated according to rank. All houses today are private property. World War I officially ended at the 11th hour of the 11th day of the 11th month of 1918, with the signing of the Armistice. Remembrance Day is still observed at that time, and this year’s ceremonies will take place today, at the 11th hour of the 11th day of the 11th month of 2011. World War I, The War to End All Wars, was fought from 1914 to 1918. Just over 20 years later in 1939, World War II broke out and lasted almost seven years. Nazi Germany, and the war in Europe, finally came to an end with the signing of an unconditional surrender on May 8th 1945. World War I officially ended at the 11th hour of the 11th day of the 11th month of 1918, with the signing of the Armistice. Remembrance Day is still observed at that time, and this year’s ceremonies will take place tomorrow at the 11th hour, on 11/11/11. This historic event took place in the building shown above, which is located in the Karlshorst district of Berlin. 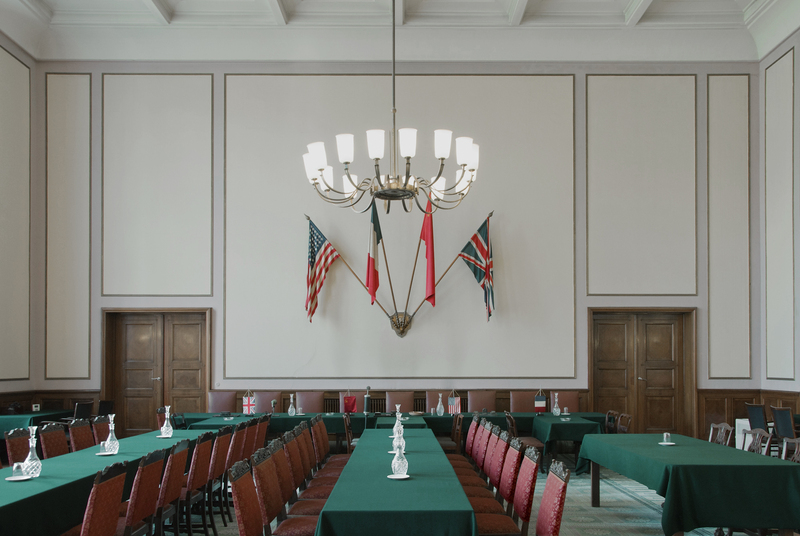 It was built in 1936-1938, and served as the officers’ mess of the German Armed Forces Pioneer School. 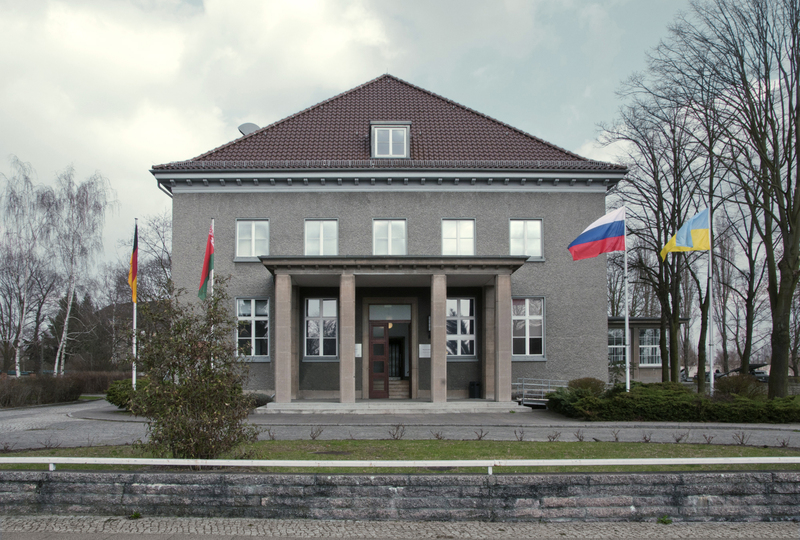 After WW II, it was the seat of the Soviet Military Administration in Germany from 1945-1949. Today it is the German-Russian Museum. This photograph was taken in 2010, 65 years after the signing of the instrument of surrender took place in the large ground floor room at the back of the building. Haute Vitrine is French. The word haute sounds like “oat” (as in oatmeal) and it literally means “high.” The word vitrine rhymes with “caffeine.” So Haute Vitrine sounds a bit like the more common phrase Haute Cuisine. For me, Haute Vitrine presents a feast for the eyes in the same way that haute cuisine presents a feast for the palette. The French word vitrine literally means a glass cabinet or showcase used to display precious objects in a shop, museum or home. Vitrine also means a store window. In the early days of street photography in Paris, windows were popular subjects with French photographers including Atget and Brassai. Shown above is Repetto. 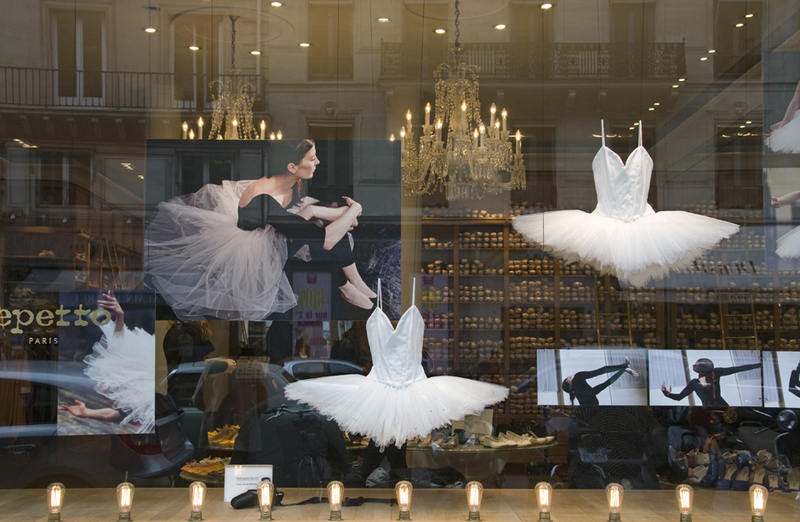 This shop window in Paris was the first in my ongoing series of vitrines around the world. Since its inception in Paris in 2009, this body of work has grown to include window reflections in Berlin & London, Jerusalem & Tel Aviv, New York & Las Vegas, Ottawa & Montreal, Toronto & Vancouver. The series is called Haute Vitrine, and my blog was named after it. Today Haute Vitrine celebrates 100 posts in 100 days. This photograph was taken just a few months after The Canary closed its doors for the last time in April 2007. Today, nothing is left on the exterior of the building to remind passersby of this well-known Toronto diner, and the interior of the restaurant has been gutted to the walls. The Canary operated here, at the corner of Cherry and Front Streets, from 1965 until 2007. The restaurant originally opened in 1960 at Dundas and University, where it remained until moving to its second and final location in 1965. 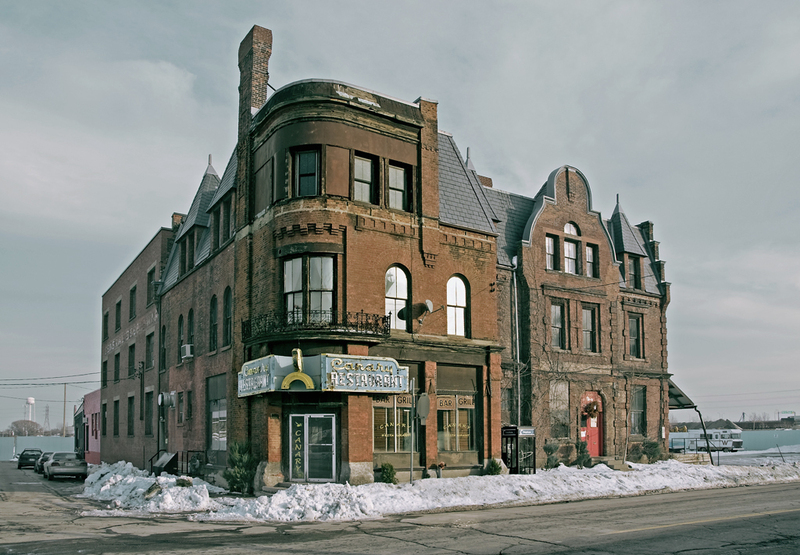 The Canary endured for almost half a century, and during all that time it was run by members of the Vlahos family. Construction of the hybrid building shown in this photograph started in 1859 with the Palace Street School, which was the section on the right. It operated as a school for 45 years and then became the Irvine House Hotel, the Cherry Street Hotel, and various other establishments. Later, General Steel Ware occupied the warehouse addition on the left side of the structure. Eventually, The Canary joined the mix in 1965, occupying the building smack dab in the middle. In 2007, I photographed more than 30 diners, both vintage and contemporary. These include classics such as The Templeton in Vancouver and lost icons such as The Canary in Toronto. This is a study of retro diners from Atlantic Canada to the Pacific Coast. Tomorrow Haute Vitrine celebrates 100 posts in 100 days.